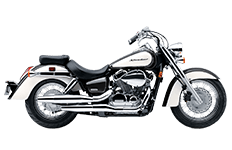 Built with classic styling, smooth lines and packed with plenty of history, the Honda Shadow Aero 1100 is truly a work of art. We understand that riders will want a sturdy set of saddlebags that not only carry all of their luggage, but compliment their bikes in a traditional fashion. We also realize that no two bikers are the same, so we feature this large collection of Aero saddlebags specifically for use with the Shadow Aero 1100. Browse through each of the pages here to learn more about our products, or give us a call with your questions and concerns.